› Author Affiliations Funding This study was partly supported by research grants from the Daewoong Pharm., and the Basic Science Research Program through the National Research Foundation (NRF) of Korea funded by the Ministry of Science, ICT and Future Planning (NRF-2015R1A5A2008833). Amlodipine has a potential to reduce clopidogrel bioactivation through the cytochrome P450 3A4 enzyme in vivo, but the clinical impact of this interaction remains controversial. This randomized, open-label, two-period, crossover study was performed to evaluate the influence of amlodipine on the haemostatic profiles of high-risk patients during clopidogrel treatment. 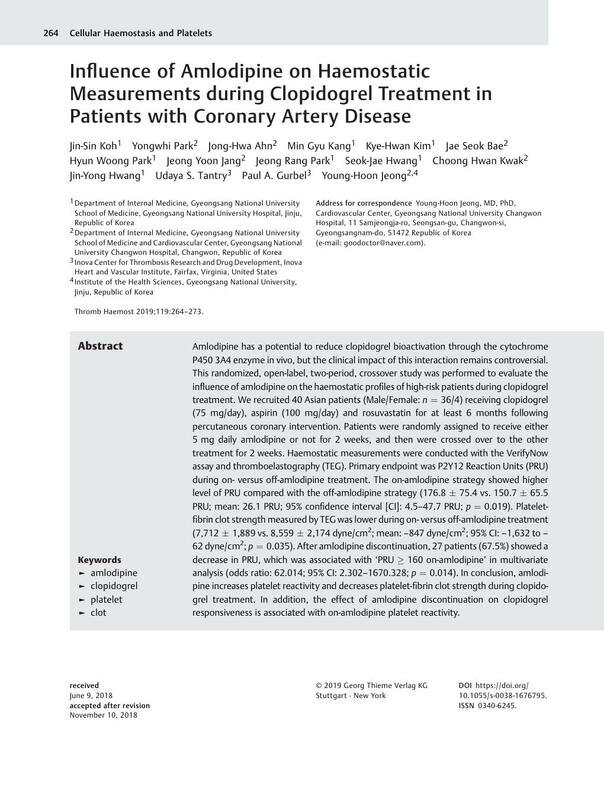 We recruited 40 Asian patients (Male/Female: n = 36/4) receiving clopidogrel (75 mg/day), aspirin (100 mg/day) and rosuvastatin for at least 6 months following percutaneous coronary intervention. Patients were randomly assigned to receive either 5 mg daily amlodipine or not for 2 weeks, and then were crossed over to the other treatment for 2 weeks. Haemostatic measurements were conducted with the VerifyNow assay and thromboelastography (TEG). Primary endpoint was P2Y12 Reaction Units (PRU) during on- versus off-amlodipine treatment. The on-amlodipine strategy showed higher level of PRU compared with the off-amlodipine strategy (176.8 ± 75.4 vs. 150.7 ± 65.5 PRU; ∆mean: 26.1 PRU; ∆95% confidence interval [CI]: 4.5–47.7 PRU; p = 0.019). Platelet-fibrin clot strength measured by TEG was lower during on- versus off-amlodipine treatment (7,712 ± 1,889 vs. 8,559 ± 2,174 dyne/cm2; ∆mean: –847 dyne/cm2; ∆95% CI: –1,632 to –62 dyne/cm2; p = 0.035). After amlodipine discontinuation, 27 patients (67.5%) showed a decrease in PRU, which was associated with ‘PRU ≥ 160 on-amlodipine’ in multivariate analysis (odds ratio: 62.014; 95% CI: 2.302–1670.328; p = 0.014). In conclusion, amlodipine increases platelet reactivity and decreases platelet-fibrin clot strength during clopidogrel treatment. In addition, the effect of amlodipine discontinuation on clopidogrel responsiveness is associated with on-amlodipine platelet reactivity. The authors are solely responsible for the design and conduct of this study, all study analyses, the drafting and editing of the manuscript and its final contents.